Features heavy-duty water-resistant PVC material; quick-release buckle closure; chrome buckle on exterior pocket; and hook and loop fastener on large compartment. Universal fit. Each bag measures 18' x 12-1/4' x 7-3/8'. Features heavy-duty weather-resistant PVC, chrome studs, and 2 quick-release buckles. Universal fit. Each bag measures 15' x 13-1/2' x 7-1/2'. The Diamond Plate(TM) 6pc Heavy-Duty Waterproof PVC Motorcycle Bag Set is a top pick when it comes to adding luggage to your street bike. The universal fit allows for quick and easy installation and fast removal. Quick release buckles grant smooth access to bag contents. Chrome stud accents. The 6 piece bag set includes windshield bag, sissy bar bag, tool bag, barrel bag, and two 14-1/2' x 12-1/2' x 7-5/8' saddlebags. 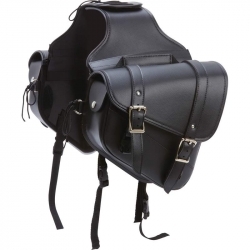 Features 3 adjustable buckles with clip closure and roomy interior. Universal fit. Each bag measures 18' x 12-1/4' x 7-3/8'. Features embossed cow grain design with studs, padded handle, buckle closure, and roomy interior. 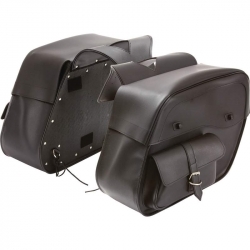 Each saddlebag measures 15-1/4' x 10' x 6-1/4'. 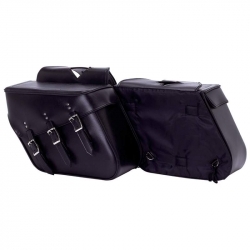 Incredible design style and durable construction pair to create an impressive, waterproof motorcycle luggage set. The Diamond Plate(TM) 4 Piece Heavy-Duty Waterproof Studded PVC Motorcycle Luggage Set will have you ready to saddle up and ride! Accent studs shine in complement to the black of the luggage bags. 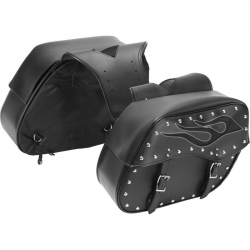 This affordable motorcycle luggage solution features convenient top flap openings for immediate access to your belongings. Designed for maximum storage and usability, with the ultimate in waterproof safeguards. Each bag is accented with buckled straps for maximum protection and security of luggage contents. 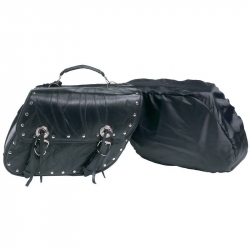 Luggage set contains 2 Studded 18' x 10-3/8' x 7-1/2' Saddlebags w/fender pads, a Studded 12' x 4-7/8' Tool Bag, and a Studded 8' x 10-3/4' x 5' Sissy Bar Bag with Reflective Strip. Constructed of Heavy-Duty Waterproof PVC. 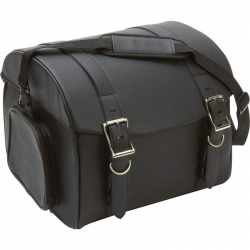 Features heavy-duty waterproof cover; faux leather texture; overlapping lid with buckles; zippered closure; roomy interior compartment; hook and loop fasteners; 2 side zippered pockets; silver-tone hardware; and adjustable shoulder strap. Measures 15' x 13' x 14-1/4'. Features heavy-duty weather-resistant PVC, 2 adjustable buckles with clip closures, 2 snap closures, and silver-tone hardware. Universal fit. Design allows for single bag or double bag application. Each bag measures 10-3/4' x 12' x 4-1/2'.